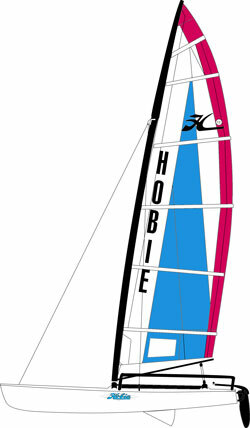 The Hobie 17 was introduced in 1985 as the new, hi-tech singlehanded boat to fill the market niche of the Hobie 14. Many new concepts were introduced on the 17: Integral hiking / trapeezing wings Spring-loaded pivoting daggerboards controlled with a single line Mylar / Dacron taffeta sails First Hobie to be designed with a Comptip New rudder castings that would be retrofitted to the 18 and be standard on all future models. The boat was an immediate success, and competitive fleets sprouted up in North America, Australia and to a lesser extent in Europe, where the boat was built with an all-aluminum mast, tapered above the hounds. The 17 became an ISAF International Class in 1990. The initial minimum boat weight was 315 lbs / 142.9 kg. Hull durability quickly proved to be an issue, and the while the class rules still stated “315 lb minimum weight” until 2000, there were no boats built to that weight. There were few boats that weighed less than 340 lbs, and many were significantly heavier, especially the white powder coated aluminum “Formula” boats of the early ’90s. In 2001, the minimum weight in the class rules was raised to 330 lbs / 149.7 kg, which more accurately reflected the boat’s construction. Competitive boat weight is 330 – 350 lbs. The minimum crew weight according to the class rules is 160 lbs / 72.6 kg. This is advantageous in light air and chop. However, at that weight, the boat will quickly become overpowered in any breeze over 15 kts. All-around optimum crew weight has proven to be in the 170 – 180 lb range. The 17 is a heavy air machine. The added leverage of the wings for trapezing makes the 17 go upwind like no other catamaran, and the main is easily depowered with a 6:1 downhaul, the mast rotator, 2:1 outhaul and a 7:1 mainsheet. Downwind, the boat is pitchpole resistant (not “proof”) and a bit underpowered, which makes working the waves a high priority. Downwind, the boat is sailed at 90° to the apparent wind. The 17 is uncomfortable to race in under 7 knots of breeze, since most of the time you’ll be sitting on the forward wing tube. Weight is kept as far foward as possible while keeping the bow tips out of waves and to keep from pitchpoling. In very light air downwind, racers will often stand out on the bow, holding on to the bridle wire to keep the sterns out of the water. Raising the windward rudder downwind is a common practice. Other than the boat weights, very little changed on the 17 during its production life. The most significant change has been the introduction of integrated traveler tracks that accept the larger-wheeled Tracker traveler car – a highly desirable upgrade. A retrofit surface-mount track is available for older boats. The original traveler car would not move under high load and would shed wheels if forced. Newer sails are most competitive and are of much higher quality than those produced prior to 2000, and a bit longer in the luff. Early sails were made by Neil Pryde; all class-legal sails are now made by Hobie. 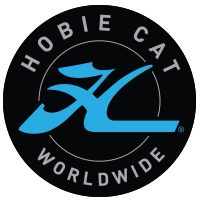 In 2004, Hobie Cat announced that they would be stopping production, but at the request of many owners, made one last production run. The last boats sold have a model year of 2007, even though they may have been in that 2004-2005 run. New, replacement crossbeams have limited or no availability. Replacement masts use the Getaway section, which is a bit heavier. A double-ended 6:1 downhaul, with the ends led out to the wings is a necessity as are carbon or fiberglass rudders. Most racers will also install a shock-cord inhaul on the boom, and connect the two centerboard lines together so that the leeward board can be lowered from the windward side. A positive mast rotation system is frequently used to keep the mast in rotaion in light air and off the wind. A full width batten is used for the second shortest batten to keep the leech from hooking under high mainsheet load. Like most Hobies, the 17 is very robust, however, there are some a few things that will extend the competitive life. Water left in the wing tubes will freeze in the winter and crack the tubes. Trailer cradles are a must to prevent rollers from pushing through the relatively thin hull bottom. This usually occurs when stepping the mast or from snow loads. The mainsail should never be folded, as it will crease permanently and eventually delaminate. Deck ports are a sure sign of leaking wing tubes. Often, the deck will get soft just forward of the rear crossbeam, where the skipper sits down in a jibe. The crossbeams have thin sections and should be inspected thoroughly for cracks, especially at the underside of the hull joins. Used boats sell for $750 – $5,000, with competitive boats at the top of that range.